Dimensions in mm: 900 (w) * 562 (d) * 1850 (h). Space above the shelf: 830 (w) * 530 (d) * 275 (h). 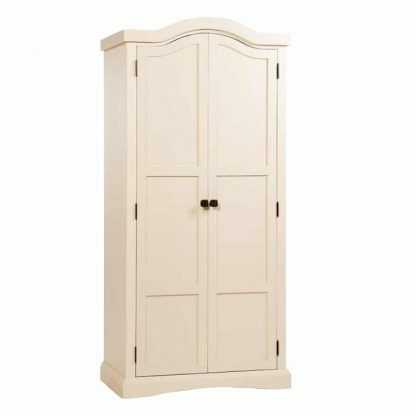 The Quebec 2 door wardrobe reflects traditional French furniture design and is finished in a soft, warm cream. Manufactured from pine and mdc, the 2 door wardrobe is finished in cream and each door has an antiqued brass metal, square handle. Inside the 2 door wardrobe is a shelf. The carcass back is made from strong plywood. Delivery: FREE delivery on UK mainland. This 2 door wardrobe is delivered for simple home assembly, following the easy to follow assembly instructions. Please allow 2 – 3 working days for delivery of your new Quebec 2 door wardrobe.